Held a ministerial position for over 29 years; working with young people, in community development and on a national engagement level in the not-for-profit sector. 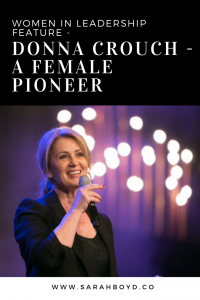 First female National Executive member for the Australian Christian Churches. Married to Stephen and together they have 3 children. 1 Can You Give Us An Insight Into The Beginning Of Your Journey As A Woman In Leadership? My journey on Hillsong staff started in 1985. I came on staff to work as the assistant youth pastor and then 3.5 years later, became the youth pastor. We had a small team, it was like “you’re the best man for the job, get on with it”. As a woman, working within our church was normal. It was only when I went outside our church (to ministers gatherings or youth conventions) did I then discover that there weren’t many women there. There were a lot of married men, with pastor’s wives, but no female pastors. I came to find out quite quickly that I was very much the odd one out. But when you know in your heart of hearts that you’re passionate about something & you have a sense of “this is what I’m supposed to be doing”, that’s all I was aware of. I just put my head down and worked really really hard. 2 What Has Been Your Philosophy In Regards To Leadership? When you start to engage out there and hear different peoples opinions, it does have the ability to really throw you. I remember one well-meaning minister saying “the reason you’re doing this is because God couldn’t find a man for the job; because he wouldn’t ask a woman to do this”. At the time I remember agreeing with him. But I came to realize that wasn’t true at all. I’m a minister, I’m a Christian and a follower of Christ. Maybe this was something God picked me for, not because I was second best, but maybe he just picked me for it. When I went back to the very first chapter of the bible, I saw God made mankind, male and female and both in his own image, equal and gave them the same job. They were both made differently, and they both reflect something of who God is. There’s nothing inferior about being a woman. So there’s not one above the other, there’s not one usurping the other. I couldn’t see other philosophies in the bible. I started to realize that even in faith circles that there were cultural understandings of women in leadership that I don’t believe lined up to the bible. So who are you going to get the truth from? You have to be really selective in that. For me its come out of my relationship with God & what I believe to be true in the bible. That’s been my philosophy. 3 What Have Been Some Of Your Personal Biggest Challenges In Leadership? Definitely being a woman in leadership and being single. If you’re going to do something great you’re going to have to work hard and I did work hard. Not just myself, but the whole team. What that meant was I didn’t have a social life or a relationship, it was work, work, work. I literally worked myself into a very isolated position personally, hoping that maybe one day I would just meet someone and it would all fix itself up, but that didn’t happen. So I had to learn to really give myself permission to have some balance in my life as a single woman. As a result of that I did end up meeting someone and getting married, which was fantastic. But then we started having a family. I thought it would be time to scale back my work, but my husband started a business so we were living off one income, which was mine. I had 3 children between the age of 34 and 39, working 6 days a week in senior leadership position, with my husband starting a doctorate as well as running his own business practice. So figuring out the stretch of how do I bring up young children? how do I support my husband in business? how do I say yes to fantastic opportunity at work? Learning to grow into the stretch. You don’t feel like you’re doing that well on any of it and you’re tired. But again there’s that deep sense of calling. Also, back then I knew if I did it badly, it might disqualify other girls coming behind me. Maybe I could help create a model where people thought women are fantastic in this senior management role. 4 What Are Your Thoughts On The Landscape Of Women In Leadership In Churches Today? At Hillsong there’s actually a very established commitment to bringing women through. Brian, our senior pastor, kind of forgot you were a woman or single or pregnant and just saw potential. I would say within other churches in our movement, there’s a lot of women in the last 15 years who have stepped up alongside their husbands. Who are not just playing a supporting role but are very much in ministry together. And there are women who are in and of their own right are ordained ministers. But we still have a way to go with women on boards. 5 What’s A Mistake You See Women In Leadership Making? One mistake some women make is waiting to be invited. They are waiting to be given permission to step up. They don’t want to look pushy or aggressive. And yet men, in a really healthy way, will be confident and put their hand up. If they feel like there’s more in them, they’ll ask for a raise or a promotion. And that’s something I’ve learnt from men. For example, when the opportunity came up to become a director of our movement, a man didn’t come up to me and say “I think you’d be fantastic”. I had a real deep conviction, many years before, that maybe that would be something I might be required to do. The scary thing was no one else thought that or saw that, and I had to believe in myself enough to put myself forward. This was terrifying because there’d be no women who’d done that before. It came back to a core belief that I had to be true to. I didn’t matter about getting on the board, it matter that I had the courage to step up. 6 Have You Had Any Experience With Boys Clubs & How Have You Dealt With Them? Of course, but I would give one word of advice to every woman, don’t use the words “boys club”. Straight away it polarizes men and women. It makes you look like a victim, it makes you look weak, it makes you look like you don’t have power. What can you do about your gender? You can’t do anything. You have to focus on what skills you can build so this won’t be a problem. I can’t change my gender but I can increase my skills. Coming onto my role with our movement, there’d never been a woman in that environment. I was aware when I came into that environment, that this was going to be really foreign and these guys are not going to feel comfortable (even though half of them had never been on that team either). One of them even said a few years into it “I’m finally getting used to a woman being on this team” and he was trying to be nice. But I was thinking “but you’ve been on this team just as long as I have”. How crazy is that? But again you’ve got to let it go & not get all inflamed. Don’t give it oxygen to it in your own mind. My approach is hopefully I can create an atmosphere where I’m not making them feel uncomfortable. I need to make this group of people feel like I belong. It means I’m there to do business, I’m there to contribute as a director. Its been challenging. I’ve had to learn to be more confident. 7 What Advice Would You Give A Female Going Into A Leadership Position For The First Time? 1. Make your leadership not about a position or title or how you’re perceived, make the leadership opportunity about helping people. 2. Be Confident. Not just confident in speaking upfront, but carrying a deep sense of confidence that you have something to offer. 3. Back yourself. You have something to offer – you’re not the whole package, there’s a whole lot to learn but you’ve got something to offer. 4. Don’t come into leadership looking for people to give to you permission to succeed. Come in and shine. 5. Whatever you get given, occupy it. Whatever you get no matter how small it may seem, grab it and occupy every bit of space with that opportunity. Give it 1000 percent, speak up more, don’t wait to the end of the meeting to put your hand up, be assertive, put yourself in the game, back yourself.